“Virtual Springfield” is truly a gem. Years in the making, this software for Windows and Power Mac computers takes Simpsons fans into a virtual-reality tour of Springfield — from Moe's Tavern to Krustylu Studios. A particular hoot is the Simpsons home, where you can read Homer's mail or thumb through the family's photo album. This is an engaging 3D animated universe that will consume hours of your time exploring more than 50 interactive locations, many with animated sequences featuring Simpsons characters and original cast voices. A bit of animated violence and a couple of suggestive moments prompted Fox to give this software an advisory rating of 13-plus. But any parent who lets their kids watch “The Simpsons” should have no objections to the content here. There's about 50 famous locations. Most of these locations feature Simpsons characters, voiced by the original cast members. 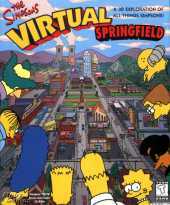 Although it is billed as a "game," Virtual Springfield is really more like an interactive 3D atmosphere. There are a few small (and I DO mean small - as in, finishable in 10 minute or less) mini-games scattered around the town, but all of them are boring. One of the bigger games is a treasure-hunt of sorts: if you can find all the hidden baseball cards in the game, you will be treated to extra animations and URL of a website (that no longer exists). This is merely a ploy to trick you into clicking as many objects as possible to reveal animated sequences, and you even have to exploit some bugs to find all the cards.